As we prepare for the season 1 finale of ABC's Black-ish, let's take a look back at how Black-ish quickly became one of America's favorite new sitcoms. 1. Remember when the Black-ish trailer first aired, promising the story of a well-to-do African-American father grappling with how to ensure that his family maintains a sense of cultural identity in the face of his and his wife's success? The premise was met with reservations, side eyes and several questions, like, was Black-ish going to be the new Cosby Show? And what exactly did they mean by "Black … ish"? 2. But Black-ish creator Kenya Barris and the show's writing staff let us know what kind of show we could expect and quickly won skeptics over with defining moments like this one from episode 3, "the Nod," in which Dre teaches his son, Junior, about the long-standing tradition of acknowledging other black people with a simple head nod. As Barris stated, "The show is about a black family—not about a family that happens to be black." 4. … but we've also had the pleasure of watching their parents, Andre (Dre) and Rainbow (Bow) Johnson, played by Anthony Anderson and Tracee Ellis Ross—who experienced very different upbringings—hilariously employ a "make it up as they go" method of parenting, seldom getting on the same page about anything other than the fact that they both love their children. 5. Dre and Bow's parenting efforts are further complicated by Pops, Dre's father, played by Tony and Emmy Award winner Laurence Fishburne, who represents a more "old school" way of thinking and is always criticizing and questioning Dre's parenting skills … and his blackness. 6. The show added another layer of hilarity when it introduced Dre's mother and Pop's ex-wife, Ruby, played by everybody's favorite aunt, Jenifer Lewis, serving up her signature scene-stealing style as she constantly spoils Dre and butts heads with Bow. 7. Then Black-ish topped it off with Dre's quirky co-worker, Charlie Telphy, played by Deon Cole, who can best be described as "touched." 8. Together these endearing characters take America inside the living room of a black family as it tackles issues such as how (some) black people refuse to acknowledge their gay relatives, and how (most) black people don't vote Republican. 9. 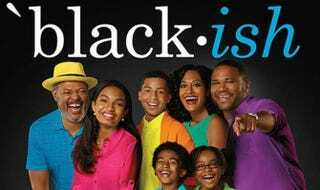 In doing so, Black-ish, through the use of "inside" jokes and references, gives many African Americans the (not-so-common) opportunity to watch characters on TV with whom we identify culturally while it shares these experiences with a broader audience. Most impressive is the show's ability to entertain both groups in the process, like the time Dre and his sister, played by Raven-Symoné, had an entire conversation about nothing by stringing together a series of phrases—familiar to many African Americans—that have absolutely no relevance. 10. Not only has Black-ish brought us the first black-family sitcom on a network in years, but its success has already helped open the door for more shows centered on families of color, such as ABC's forthcoming Uncle Buck and Dr. Ken. What are some of your favorite moments from Black-ish's first season?